8CT Will You Be My Groomsman and Best Man Proposal Card. Time to SUIT UP cards. 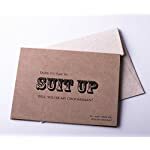 7CT Groomsman Cards, 1 Best Man Invitation with Mailing Envelopes. Groomsman Proposal.